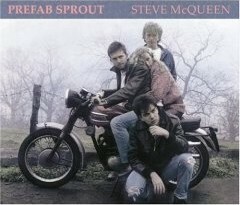 For anyone who either is completely unfamiliar with Prefab Sprout or didn’t understand the fuss that surrounded its sophomore set Steve McQueen after its release in 1985, here’s a tip: Avoid reading Paul Lester’s liner notes until after the album’s contents have had time to come into focus. Over the years, Lester has played the role of Prefab Sprout’s biggest fan to the hilt, and every album that the band has released has been greeted by heaps of his glowing praise. Here, he refers to Steve McQueen as "the Pet Sounds of the ’80s," and although his enthusiasm undeniably is genuine, his statement raises expectations that the endeavor can’t possibly meet. Recently reissued, Steve McQueen has been augmented with a bonus disc that contains acoustic versions of eight of the album’s 11 songs that Prefab Sprout recorded last year. Not all of the new arrangements are successful, but in stripping away the highly glossy production of the original endeavor, the smartly crafted lyrics of front man Paddy McAloon are brought to light. Despite their outward appearance, these are not ordinary pop songs. Like a wolf in sheep’s clothing, they sneak in quietly, and strike at the most unsuspecting moments. Initially introduced to the U.S. market as Two Wheels Good, Steve McQueen is a conceptual work about the male experience, though McAloon escapes from the typical rock star posturing by viewing his behavior through the lens of the future. He never really apologizes for his array of misguided thoughts and misdeeds, but his regrets certainly are palpable. Desire As, for example, begins with the arrogant kiss-off, "I’ve got six things on my mind/You’re no longer one of them." As the song progresses, however, its perspective shifts, and McAloon comes to realize his mistakes. On When Love Breaks Down, he chisels away at the lies that men tell until he reveals that the reason that they do it is to avoid both commitment and heartache. Meanwhile, Moving the River outlines how the chase often becomes more important than getting the girl, while on Horsin’ Around, he offers a blunt admission that his infidelities have left him with nothing but shame. The arrangements employed by Prefab Sprout on Steve McQueen are, however, somewhat more problematic in that the collection forever will be tied directly to the sounds that were emanating from the U.K. in the 1980s. Although a lot of the material falls into the same vein as the works of Howard Jones and Spandau Ballet, the band also found room to incorporate into its work the new wave-pop of Squeeze, the angry bite of Elvis Costello, and the jazzier tendencies of The Style Council into its work. The only track that continues to hold up completely, however, is Faron Young. As its title suggests, the tune is a tribute of sorts to the classic, honky-tonk country artist whose work inaugurated CMT in 1983. The rolling banjo that underscores the song further highlights this connection, thus allowing McAloon to use the image of the man known as "The Hillbilly Heartthrob" to launch his opus. Steve McQueen: Legacy Edition is available from Barnes & Noble.